Sixteen-year-old Savannah Martino is strangled to death in an abandoned house. The police rule Savannah’s murder a random attack of opportunity, which prompts the small New Jersey town to instigate a curfew and cancel football games. Isolated and afraid, Savannah’s sister, Cady, continues to communicate with Savannah through dreams. Cady knows Savannah in ways no one else knew: The beautiful, ethereal twin everyone thought was an angel was actually on the road to self-destruction. Years later a chance encounter while researching her latest novel coincides with an unexpected call from the once-rookie cop on Savannah’s case, Patrick Tunney, now a detective, who tells Cady that Savannah’s case has been reopened. Through new evidence, it has been determined that Savannah’s death wasn’t a random attack and that whoever killed her sister loved her. Despite years of interviewing convicted killers, profilers, and psychiatrists for her bestselling thrillers, Cady isn’t prepared for the revelation that someone close to her could have killed her sister. Cady is drawn into a labyrinth of deception and betrayal reaching all the way back to her childhood that will force her to find the strength she never knew she had in order to face the truth. Jensen Reilly has been running from the past since the fateful night her brother Will died. Consumed by guilt, she leaves her home, moves to a place where no one knows what she did, and eventually elopes with a charismatic artist who believes that one should only ever look forward and never back. She’s in denial, yet unable to leave the past behind. When her beloved father, Sterling, is diagnosed with a brain tumor, she returns to her childhood home for the first time in thirteen years, and the memories of her old life come flooding back. Jensen holds a haunting secret about Will’s death, and it has altered her life, alienating her from everything she once loved. The only person who knows this secret is her high school boyfriend, Ryder Anderson, who never left Colston and has become a top surgeon at Yale. Torn between the life she’s created for herself in Sante Fe with her free-spirited husband, Nico Ledakis, and the realization that it is time to face the truth, Jensen must make a decision that will change her life forever. Filled with love, sadness, humor, and a great cast of supporting characters, NIGHT BLINDNESS tells the story of one woman’s struggle to confront her demons and to see clearly for the first time, what is truly important. 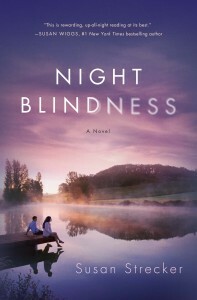 Set against the steamy background of a New England summer, NIGHT BLINDNESS is a novel about risk and redemption, the tenacity of friendship, and the ways we are hunted down by what we try to escape. As the summer winds down, and Jensen’s father’s condition worsens, she has to make the most terrifying decision of her life. She’s afraid if she tells the truth, she will lose her father. Yet, she rediscovers the value of the world she left behind, and the power of the girl she once was.